Bernard van Dieren is something of a shadowy figure who has been on the fringes of British musical history. What I think is his largest and most important work, the so-called ‘Chinese’ Symphony is one of those almost mythical works about which one has heard without ever actually hearing it. Now, thanks to Lyrita we have the work’s first-ever commercial recording. I freely confess that until this disc arrived for review – a prospect that intrigued me greatly – I knew little about the composer and nothing at all of his music. So I’m afraid this review is not founded on detailed prior knowledge but I hope I come to the music with a fresh pair of ears. So, who was Bernard van Dieren? If you know as little about him as I did some brief biographical information may be useful and for this I shamelessly draw upon the excellent and very full booklet notes by Alastair Chisholm. Van Dieren was born in Rotterdam. He came into the social orbit of a family of prominent professional musicians, the Kindlers, and became particularly close to the daughter of the house, Frida, who was a very gifted pianist and a pupil of Busoni, no less. Frida pursued a successful career in England and Bernard joined her there in 1909; they married the next year. In the pre-war years van Dieren spent some time in Germany where he met both Busoni and Schoenberg. Frida’s brother, Hans, played the cello in the first performance of Pierrot Lunaire for which Bernard was in the audience. One intriguing piece of information I’ve heard, but which is not mentioned by Mr Chisholm, is that it is believed that he engaged in some intelligence work in Germany in 1914. Van Dieren became well connected in London cultural circles – among his friends was Philip Heseltine (Peter Warlock) - and his music made some modest headway during and after the Great War. Sadly, though, he was dogged by ill health and this may have accounted in part for the fact that his music was not pushed more prominently. The ‘Chinese’ Symphony was broadcast by the BBC in 1935 but the composer died the following year and his music faded. I have given only the most sketchy detail here; those who acquire this disc will find that among its many attractions is plenty more information from Alastair Chisholm. The ‘Chinese’ Symphony, simply styled Symphony No.1 by its composer, was written between 1912 and 1914. It plays continuously but is divided into eight sections – I’m not sure I’d be correct if I called them movements. It’s lavishly scored, requiring no fewer than five vocal soloists. A large SATB choir is also needed. The orchestral forces are substantial, I suspect – I don’t know the exact scoring – although the instruments are used with refinement and discretion and there are relatively few major climaxes. With the exception of the fifth section, ‘Interludio’, which is purely for orchestra, the piece comprises vocal settings of a book of German translations of Chinese poetry published in 1907 by Hans Bethge under the title Die Chineschiche Flöte (The Chinese Flute). This collection also furnished Mahler’s material for Das Lied von der Erde and in fact section 7 of van Dieren’s symphony uses the poem, Der Trinker im Frühling that Mahler also set in Das Lied. Van Dieren’s musical language is very interesting. There’s a very clear debt to Schoenberg – though the music is highly chromatic rather than atonal. Alastair Chisholm also cites Busoni as a strong influence. That wouldn’t be surprising but my knowledge of Busoni’s music is insufficient for me to be able to make the connection. The choral writing with its extremely chromatic nature brought Delius to my mind also. Let me first deal, then, with the choral parts of the work. To say that the choral textures are rich would be an understatement. Actually, the choir doesn’t have a vast amount of music to sing – they feature only in sections 1, 4 and 8. However, what they do have to sing sounds and looks very challenging – I had access to a vocal score. At times the choir is divided into multiple parts – 9 or 10 parts at times – but in fact there’s quite a lot of doubling within those parts. Fresh from their encounter with the huge challenges of Grace Williams’ Missa Cambrensis, which I heard them sing most impressively on the radio (review) only a few weeks before the van Dieren sessions, the BBC National Chorus of Wales seems completely undaunted by the challenges of van Dieren’s writing. The five soloists all do well. Each has a solo or duet in at least one section before the full ensemble comes together for the only time in the eighth section. Rebecca Evans’ silvery tones are heard to excellent effect and she brings a laser-like focus to the passages where van Dieren requires her to sing at the very top of her register, notably in the closing ensemble. It’s invidious, perhaps, to single out one of the soloists but I was especially impressed with the singing of baritone Morgan Pearse in the sixth section. This is a cavatina, Die trennung which depicts a lover parting from his beloved at the start of the day. The soloist sings over a highly chromatic accompaniment in which woodwind are prominent and Pearse’s firm, well-rounded and finely focused sound is very pleasing. The setting becomes impassioned as the man cries ‘Lebwohl!’(2:16) and Pearse rises splendidly to the moment. Incidentally, this movement offers a prime example of how van Dieren often switches time signature, sometimes from one bar to the next, to create a sense of instability in the music. In many respects it’s the BBC National Orchestra of Wales who are the real heroes of this enterprise. They will have learned this complex piece specially for the occasion though you’d never know. As I’ve said already, van Dieren’s music is highly chromatic and rhythmically unstable. That makes particular demands on the orchestra but the performance sounds to me to be completely assured and accurate. Throughout the work copious opportunities arise for instrumental solos and without exception the players deliver their solos eloquently. Particular praise is due for leader Lesley Hatfield’s violin solos and for the work of the principal flute and clarinet. There’s no hiding place in this score because much of van Dieren’s orchestral writing is delicate and sensitive; his palette is discriminating and imaginative and he displays a fine feeling for orchestral colours. The many subdued and exposed passages are played with fine sensitivity but on the occasions where a full climax emerges the BBCNOW’s delivery is strong yet not overdone. A good deal of the writing is highly polyphonic yet clarity is always achieved. For this and for the abundance of inner detail that emerges a great deal of credit is due to conductor William Boughton and to the Lyrita engineers. I’ll discuss the recorded sound later but this is a good time to consider Boughton’s work. I’ve only seen a vocal score and in this the frequent extended orchestral passages before or after the singers are involved are just marked as bars of rest. However, even from the piano reduction underneath the vocal parts it’s clear that this is a score of considerable complexity. I’ve heard that Boughton spent a period of about 9 weeks simply editing and correcting the score and parts prior to the recording sessions. That is the sort of task I for one would be thoughtful about undertaking even if I had the expertise but it indicates the conductor’s commitment to the project. Furthermore, all that labour must have meant that he came to the sessions with a comprehensive knowledge of the score and its inner workings. Having come new to the symphony I have no yardstick against which to judge but listening to the performance I could reach no other conclusion but that Boughton was expert in the way he brings out the detail in the music, obtains clarity and, above all, conveys the sweep and direction of the music. Van Dieren’s music is almost always restless, even when superficially it seems to be calm, and Boughton guides his forces – and the listener - through the symphony very persuasively. What are the highlights of the score – and performance? The opening ‘Praeludio’ begins very delicately – a harbinger of much that is to come. Both the orchestra and, later, the choir convey a magical atmosphere as the poet thinks of his beloved in the moonlight. The third section is one of the knottier sections in the work, I found, but it’s worthy of mention. It’s entitled ‘Duettino’ and involves the soprano and tenor soloists. However, don’t let the diminutive implication of the title deceive you. This is a strange movement in that van Dieren gives each soloist a different poem to sing and so it’s not really a duet in the conventional sense; the singers are completely independent of each other. Their music is highly chromatic and expressive. In the following section the tenor sings with the contralto and this is much more obviously a duet. When the choir join in their music struck me as very reminiscent of Delius. I’ve already mentioned the baritone solo – section six – this is preceded by the longest section in the work, an orchestral ‘Interludio’. Alastair Chisholm comments that here the music is “markedly less polyphonic”. It’s a nocturne and it seems to me that van Dieren imagines the music most effectively, deploying a rich and alluring orchestral palette. I wrote in my listening notes that this is the most poetic section we’ve heard up to this point. Van Dieren pushes the bounds of tonality very far in this movement but to good effect. All the forces come together for the only time in the final section. After an orchestral introduction we hear first the soprano and tenor soloists along with the choir. Then the other soloists become involved. The music is lush and the vocal writing looks and sounds very dense. I have to say that I wondered if the complexity of the vocal textures is not a bit self-defeating. That said, there’s no denying that the music sounds very beautiful. In the final stanza of the poem, from ‘Der Mensch lebt einmal’ (Man lives only once) (3:33) the music is quietly sumptuous and after the singers have ceased the orchestra brings the symphony to a hushed, rapt conclusion. Is van Dieren’s symphony a buried masterpiece? In all honesty, I don’t think so. Given the lavish forces and the complex nature of the music I can understand why it has been so very rarely performed. Apart from anything else it must demand prodigious amounts of rehearsal time. Having said that, one can only be grateful that a commercial recording has at last come about for the score is a significant one and it’s well worth hearing. I can’t imagine that it could be better served than is the case here. The other two works are similarly worth hearing. Introit to Topers’ Tropes was intended, Alastair Chisholm tells us, as the overture to a choral-orchestral setting of Rabelais’ Les Propos des Beuveurs (The Discourse of the Drinkers). The choral work never materialised; I wonder what it might have been like. It opens with an appealing slow section in which the strings are to the fore. The spell is broken (2:57) by the eruption of much more vigorous, strongly rhythmical and fully scored music, in which vein the piece then continues. The piece is somewhat less complex than the symphony though there’s still a good deal of polyphony and chromaticism in the writing. It’s an engaging and extrovert piece and Boughton and his orchestra give it a spirited reading. The Elegie für orchester mit violoncello principale may well have been written with van Dieren’s brother-in-law, Hans Kindler in mind. That’s Alastair Chisholm’s speculation and I think it’s a pretty reasonable one. The soloist plays for almost the entire duration of the piece. Mr Chisholm suggests that the music is “rhapsodic in a Delian way with lovely moments” and I think he hits the nail squarely on the head there. The cantabile nature of the cello is most effectively exploited. I enjoyed this piece very much and much of the credit for that must go to the performers. Raphael Wallfisch is absolutely splendid, playing very eloquently and persuasively, and he gets marvellous support from William Boughton and the orchestra. This is probably the piece on this particular programme that I think has the most chance of establishing a place in the repertoire now that this recording will bring it to a wider audience. It remains only to mention the technical side of this CD. As I’ve indicated, in terms of the performances Bernard van Dieren has been very well served here. The very fine music-making has been expertly recorded by producer Adrian Farmer and engineer Huw Thomas. The sound reproduced excellently on my equipment. An abundance of detail registers without any suspicion of artificial highlighting and the fullness of the sound in louder passages is most pleasing. In short expert playing and singing goes hand in glove with equally expert engineering on this release. 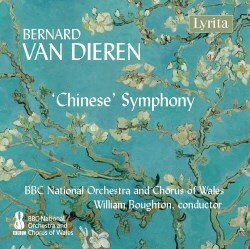 Lyrita has brought van Dieren’s ‘Chinese’ Symphony in from the cold – and they’ve done so in style.